Proteolysis of alpha-s1-casein by chymosin in cheese follows the following pattern in most ripened cheeses. 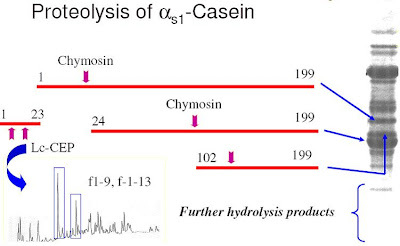 Chymosin initially cleaves at Phe23-Phe24 (its primary cleavage site on alpha-s1-casein) forming a short peptide, f1-23 and a larger polypeptide, f24-199. The former peptide does not accumulate in cheese but is rapidly degrated by the cell envelope-associated proteinase (CEP) of the starter to a range of shorter peptides, depending on the specificity of the CEP. Fragments such as f1-9, f1-13 and f1-16 are not uncommon and resolve as major peaks in reverse-phase HPLC chromatograms of extacts from cheeses such as Cheddar. Meanwhile, the polypeptide f24-199, which resolves well on urea-polyacrylamide gel eletrophoresis (urea-PAGE), is next cleaved by chymosin towards its centre at Leu101-Lys102 yielding a polypeptide, f102-199, which is also easily resolved by urea-PAGE.